‘For he [the emperor Antoninus Pius] conquered the Britons through the governor Lollius Urbicus, after driving back the barbarians and building a second wall, of turf’. This laconic entry in a fourth century biography records the reoccupation of Scotland under Antoninus Pius and the building of a frontier between the Forth and the Clyde. An inscription at Corbridge indicates that preparations for the invasion were under way by 139, and victory coins issued in 142-3 suggest that by then a satisfactory outcome could be celebrated. Top. The Antonine frontier near Rough Castle, near Falkirk. The denuded crest of the turf rampart can be seen on the left, while the figure is standing at the bottom of the ditch. Left. The neatly curbed stone foundation of the Wall, revealed in New Kilpatrick cemetery, Dumbartonshire. The Antonine Wall ran for 37 miles (60 km) from Bridgeness on the Forth to Old Kilpatrick on the Clyde. Though comparatively little of it is visible today, accounts of early antiquaries coupled with archaeological investigations from the late nineteenth century onwards have traced its course in detail. 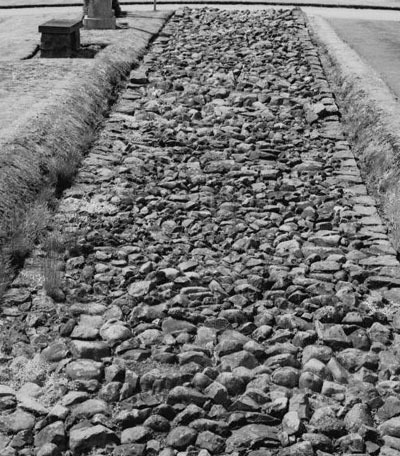 The Wall was built from blocks of turf set on a stone base 15 Roman feet (4.3 m) wide. For stability the sides were angled inwards, or ‘battered’. Its original height is not known, but if it had been equipped with a parapet and rampart-walk, as seems likely, then it might have stood about 10 feet (3 m) high to the rampart-walk and 16 feet (4.9 m) overall. Fronting it was a broad ditch some 40 feet (12 m) wide and 12 feet (3.6 m) deep. At Rough Castle, and probably elsewhere, the defences were reinforced by overlapping rows of pits (nicknamed ‘lilies’ by the Romans). Behind the Wall a road facilitated communications and the movement of troops. Lilia at Rough Castle on the Antonine Wall. A remarkable series of inscribed slabs identifies the sectors built by the three legions engaged in the task - the Second Augusta, the Sixth Victrix, and the Twentieth Valeria Victrix. 20 of these slabs have been found. Each records the name and titles of the emperor Antoninus Pius, the legion concerned, and the distance constructed. This slab, found near the Wall’s eastern terminus at Bridgeness, may be expanded to: imperatori Caesari Tito Aelio/ Hadriano Antonino Augusto Pio patri patriae legio II/ Augusta per milia passuum IIIIDCLII/ fecit. ‘For the Emperor Caesar Titus Aelius Hadrianus Antoninus Augustus Pius, Father of his Country, the Second Augustan Legion completed [the Wall] over a distance of 4655 paces’. A Roman pace was five Roman feet (each of 296 mm, compared with the imperial foot of 305 mm). Nine work-sectors, the shortest of which was 3000 paces, brought the Wall to a point some four miles short of its western terminus. This final stretch was divided up into six much shorter sectors, and the slabs here record the distances in feet rather than paces. Most of the surviving slabs have been found in this stretch. Air photography has revealed a series of temporary camps along the line of the Wall. Most lie close to the boundaries of the construction-sectors indicated by the distance slabs, and probably housed the troops engaged in building the frontier. A number of fortlets were attached to the rear of the Wall. They were provided with gates at the front and rear. It has been suggested that these were spaced at one-mile intervals, replicating the well-known milecastle system of Hadrian’s Wall, although not enough have yet been found to confirm this possibility. 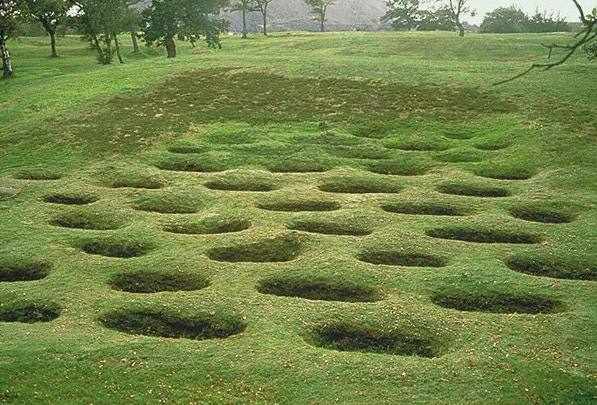 Nevertheless it looks as if the Antonine Wall fortlets, like the milecastles on Hadrian’s Wall, were intended to facilitate movement from one side of the frontier to the other, though under strict control. 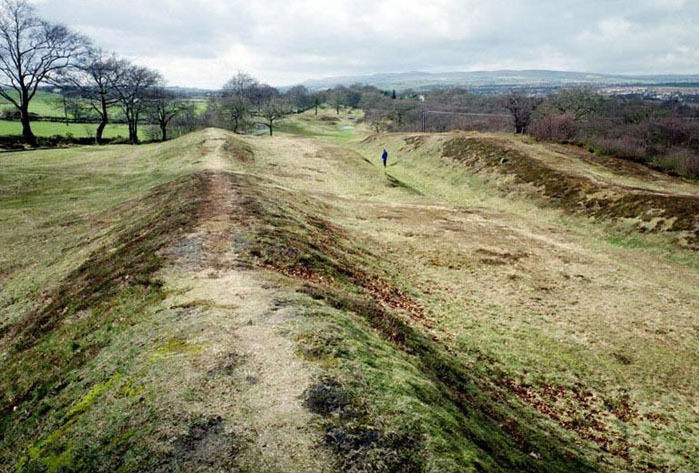 In its original form at any rate, the Antonine Wall seems intended to have been more of a customs barrier than a military front line. Small platforms and enclosures have been identified at the rear of the Antonine Wall, though they do not appear to form continuous patterns like the turrets on Hadrian’s Wall, where two are placed at regular intervals between each pair of milecastles. Their purpose is unclear, though they may perhaps have been connected with signalling or the raising of alarms. 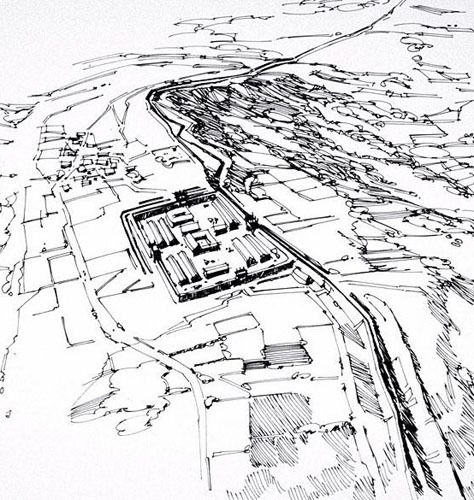 Reconstruction drawing of part of the Antonine Wall at Croy Hill. The original scheme seems to have envisaged the construction of five or six forts, either attached or closely adjacent to the Wall and spaced at intervals of six or seven miles. However, it appears that while construction was under way a decision was taken to add at least another nine forts, and perhaps as many as twelve, reducing the spacing to only two miles. 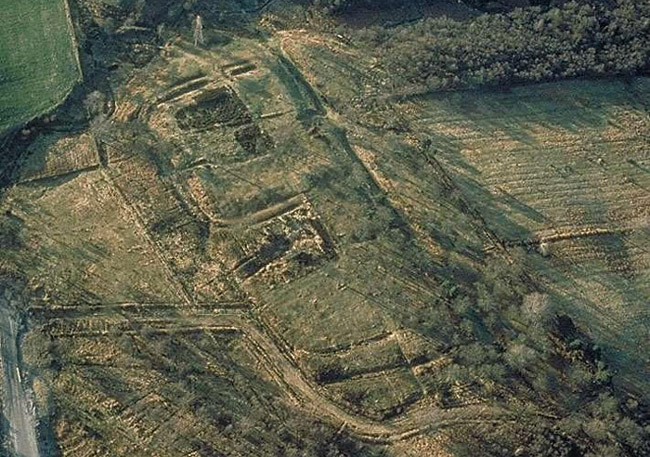 Aerial view of the Antonine Wall and fort at Rough Castle. These changes perhaps reflect an unexpectedly hostile native reaction to the establishment of the new frontier. Certainly the need to build extra forts suggests that many more troops were required to man the Wall than had originally been estimated. Why Antoninus Pius decided to reoccupy Scotland when his predecessor Hadrian’s monumental frontier between the Tyne and Solway was still barely complete is unclear. Perhaps there were compelling strategic reasons of which we have no knowledge. But it is also possible that the invasion was driven by the new emperor’s need for military prestige, something he had not gained by his own hand. An easy victory by generals operating ‘under his auspices’ in a remote province might have been just what the unsoldierly Pius needed to secure his grip on power. The Antonine Wall’s unique series of distance slabs, with their explicit visual messages of Roman supremacy over barbarian foes, accords with this possibility. So too does the fact that, almost immediately after his death, Antoninus Pius’s short-lived frontier was given up.